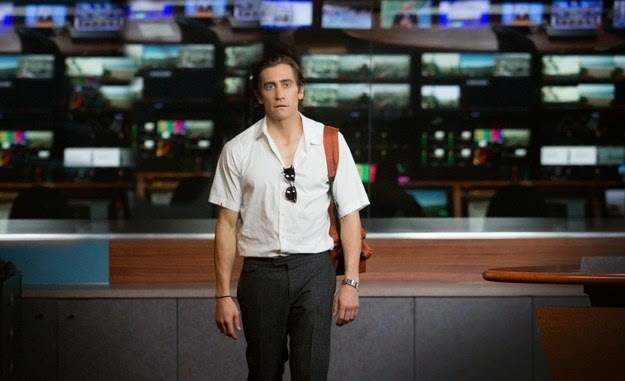 Home / TALK OF THE TOWN / ‘’Nightcrawler’’: A Different Look At Gyllenhaal and L.A.
‘’Nightcrawler’’: A Different Look At Gyllenhaal and L.A. The pulsating shimmer of Los Angeles at night can seem either like a dreamscape fantasia or a topography of nightmares. In the new film “Nightcrawler” it is both, a land of opportunity and madness and left in some measure for the viewer to unravel. As the film opens, Lou Bloom (Jake Gyllenhaal in a transformative performance) is adrift on the fringes of society, stealing scrap to sell at salvage yards. After seeing a freelance video news team swoop in during the aftermath of a freeway car crash, he sets a new goal for himself. The right person finding the right opportunity that fits his specific pathology just so, Bloom makes a quick study of his new profession, while encountering a more established competitor (Bill Paxton), an overnight-shift television news producer (Rene Russo) desperate to make a mark and a hapless tag-along assistant (Riz Ahmed). Bloom’s rise comes with no minor cost and a small body count. 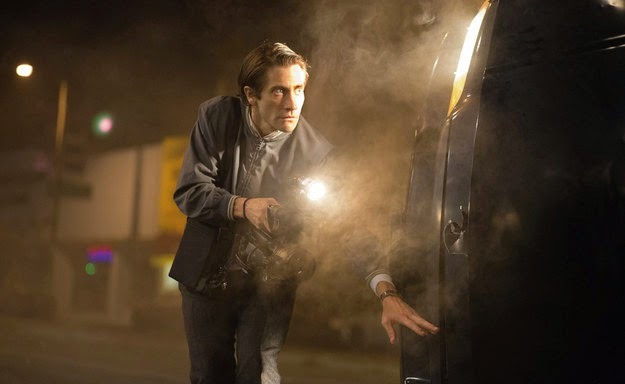 The enigmatic character of Bloom, stubborn, self-taught, self-made and possibly sociopathic, and personified by Gyllenhaal’s full-throttle performance, makes “Nightcrawler” many things at once. It is a character study, a disturbing look at the impact of media and culture, a fascinating glimpse into the nocturnal life of Los Angeles and an unpredictable, pulse-quickening thriller. “I didn’t look at Lou as a deranged, damaged person,” said Gilroy. “I really wanted to look at a person who doesn’t have the programming and support from childhood and has limited tools to survive. To me the through-line of the character was somebody trying to survive in today’s world”. Gilroy started with an interest in the crime photographer of the 1930s and ’40s known as Weegee and then began to learn of the contemporary world of news videographers who refer to themselves as “nightcrawlers.” Connecting these together was a long fascination with what he called the “kabuki theatre” of local L.A. news. In crafting a specific vision for Los Angeles, cinematographer Robert Elswit (an Oscar winner for “There Will Be Blood”) shot nighttime scenes with a digital camera and daytime scenes with a 35mm film camera. The production took place at more than 70 locations around L.A. on a 29-day shoot, including 22 night shoots in a row. Gilroy noted that for him, Gyllenhaal’s gaunt look in the film reduces his face to angular planes that catch light in different ways, shifting between handsome and grotesque. 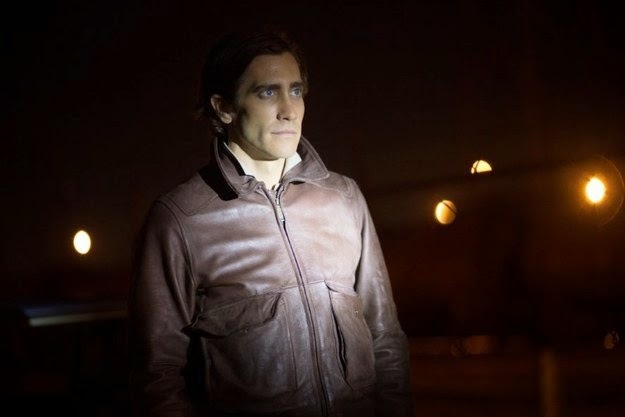 Gyllenhaal evokes the hungry demeanour of a coyote — “Lou is a nocturnal predator who comes down from the hills at night to feed,” Gilroy said — and the film’s vision of Los Angeles is also meant to capture the city’s interface with nature that many films overlook. Production designer Kevin Kavanaugh spent many nights just driving around Los Angeles looking for places that captured the feel of the city after the sun goes down, specific nondescript strip malls, Lou’s apartment on a hilly street not far from Dodger Stadium or the glass box Chinese takeout place that resembles a fish tank and is a key location for the story. The more commonly filmed downtown area was largely avoided. ‘’NIGHTCRAWLER’’ is released and distributed by CAPTIVE CINEMA.